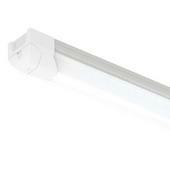 High performance LED batten for multi-purpose applications. Continuous through-wiring installations. Up to 56% energy saving compared to T8 fluorescent. Steel body construction with powder coat finish. Polycarbonate reeded diffuser and end caps. Self-test emergency as standard. Corridor Function for dimmable microwave sensor models. Instant light output with unlimited switching.